TUCSON, AZ – The Tucson Roadrunners, proud American Hockey League affiliate of the Arizona Coyotes, return home this weekend following a successful three-week road trip. With contests Saturday night and Monday afternoon, the first-place Roadrunners host the Bakersfield Condors for a set of games. 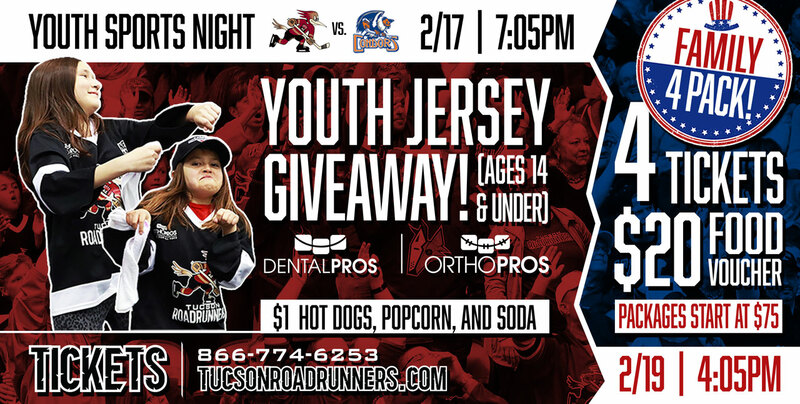 Saturday night is Youth Sports Night, featuring a youth jersey giveaway to children 14 and under, courtesy of OrthoPros and News 4 Tucson. With puck drop set for 7:05 p.m., the evening also features $1 hot dogs, popcorn and soda at concession stands. Monday afternoon will feature a special start time of 4:05 p.m. and a fidget spinner giveaway for those 14 and under. Tickets for both games start at just $15 and are on sale now HERE. For more information on the evening, contact the Roadrunners at 866-774-6253 or visit the team’s office at 175 W. Broadway in Tucson.